About 350,000 people live in London, Ontario, Canada. This city is located in a snowbelt – which means that fluffy, white-coloured precipitation is business-as-usual for several months of every year. Unlike Vancouver, where winters are mild and snow is rare, the city of London possesses proper snow removal equipment. Over the past few days this community has, admittedly, received an unusual amount of the white stuff. For those who have the option, staying off the roads makes sense. But even under conditions such as these, nurses still have to show up for their shifts at hospitals. And patients – such as those on kidney dialysis – need to keep their appointments. These people don’t have a choice. And they have now been left to fend for themselves. 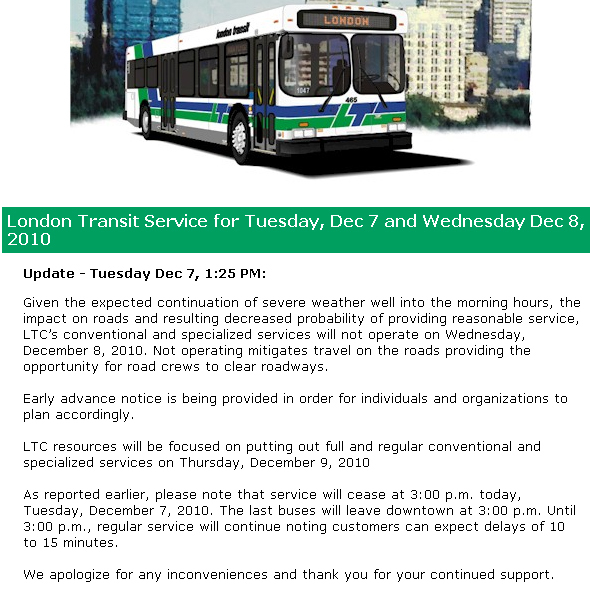 Shortly past noon today, the London Transit Commission announced it was ceasing service around 3 pm – and adding that there will be no transit at all tomorrow. All services – including the specialized ones that transport elderly kidney dialysis patients – are canceled. Not operating mitigates travel on the roads providing the opportunity for road crews to clear roadways. Translation: a civil servant has decided that your kidney dialysis appointment is a trivial matter. Making things easy for the unionized city workers who drive the snowplows and the sanders is a higher priority. Tough luck. You’re on your own. Be grateful we’re giving you lots of notice so you can make other arrangements. Moral of the story: The transit system – even in well-prepared communities such as London – will let you down. Your daughter’s gas-guzzling 4×4 won’t. This entry was posted on December 7, 2010 by Donna Laframboise in Uncategorized and tagged public transit.